There is still time to sign up for next month’s Project Pet! Come enjoy your Sunday afternoon painting a portrait of your beloved fur baby while enjoying a delicious mimosa! The finished product makes an incredibly thoughtful holiday gift for a loved one as well. 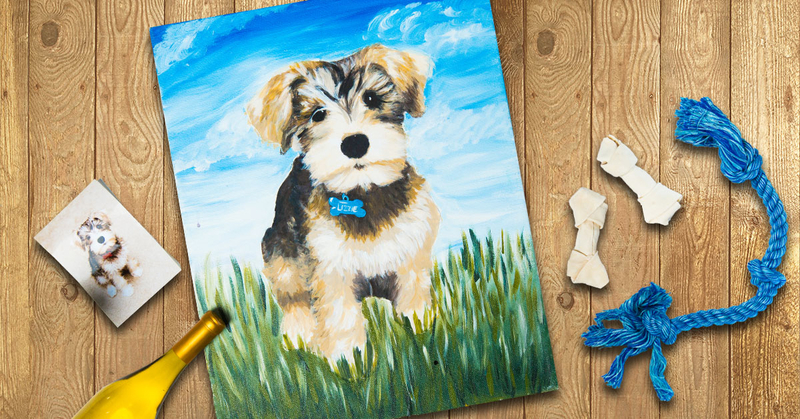 Does painting your pet make you nervous? Don’t be! You send us your favorite picture your fuzzy friend and we edit it and print it in black and white onto a canvas for you to use as a guide. Its almost like paint-by-numbers accept we teach you how to mix the colors and paint the textures to create a personal likeness of your buddy. These classes are always full of animal lovers and cute pictures. What could be better? If this sounds like the perfect class for you, act quickly before the deadline of Friday October 26th at 4pm! We know that’s coming up fast, but it’s just enough time for you to snap a cute pic and send it in! We hope to see you on November 4th to Paint. Drink. Have Fun. with us for Projet Pet!